Celebrate the richness and variety of chocolate with these expertly crafted treats! 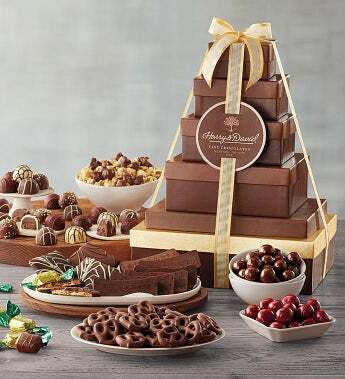 Enjoy juicy chocolate cherries, dark chocolate Moose Munch® Popcorn, chocolate malt balls, a pound of signature chocolate truffles and more. There's a special sweet something for every chocolate lover. Deluxe includes: Chocolate Moose Munch® Popcorn, 10 oz. ; Chocolate Cherries, 6 oz. ; Milk Chocolate Mini Mints, 2.43 oz. ; Dark Chocolate Maltballs, 6 oz. ; Chocolate Decadence Cake, 12.5 oz. ; Milk Chocolate Dipped Pretzels, 6 oz. ; 3 Milk Chocolate Moose Munch® Bites, 0.5 oz. each; 3 Dark Chocolate Moose Munch® Bites, 0.5 oz. each; Signature Chocolate Truffles (Coffee, Cherry, Raspberry, Almond, All Dark, Double Chocolate), 16 oz. Total Net Weight: 3 lbs. 13 oz.